Mount Benson is a small mountain by West Coast standards; its summit is a modest 3,350 ft (approximately 1,000 meters) above sea level. 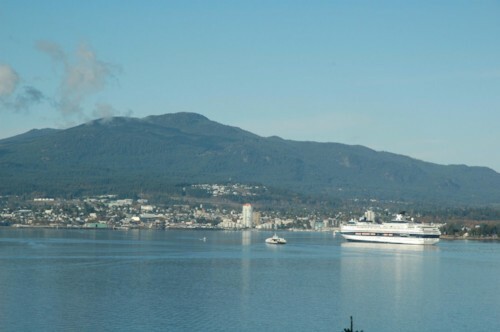 But, for the residents of Nanaimo and the surrounding area, this mountain is important. It is situated just west of the City, and is an important backdrop and recreational destination. Just as the timber was re-establishing itself, a forest fire razed the mountain in 1951. Long-time residents say that regrowth of the forest has only really happened in the past 20-25 years and some say there are patches that have never re-grown. In the summer of 2003, new logging began to appear near the summit on the front slope of the mountain, and community response was immediate and urgent. It suddenly became apparent to everyone that the natural green backdrop to the City of Nanaimoand surrounding area was about to disappear for another generation, or longer. Further negative impacts on the Millstone River watershed, and the fish and water quality values in that river. In response to public pressure, the Nanaimo & Area Land Trust (NALT) began communications in 2003 with the owners of the top property on the front face, seeking alternatives to logging. There are several different owners of the mountain. On the front slopes (north-east) they include TimberWest, BC Crown Land (leased to Malaspina University College), Island Timberlands (was Weyerhaeuser), and the Department of National Defense. Until recently, the 523 acre property that extends across the top of the front face was owned by a development company called Pennclan-Reeve. For the timber companies, the primary use of their properties is timber harvest. Initially, Pennclan-Reeve stated that their reason for logging their property was to "open up the viewscape" and develop the property as view lots. However, they later abandoned this idea and focused on revenue from logging the timber. About 100 acres of this property was logged in 2003; and at least another 50 acres during 2004. There was no further logging in 2005, and only a small patch of the logged area is visible from downtown Nanaimo. Click here for more information about The Conservation Covenant.